As of Sept. 21st, 2016, the SSL cert for our old domain name expired and will no longer work. Is the DeployBot Webhook in your Git host for our old domain name (dploy.io)? The expired cert would cause commits to no longer appear automatically in DeployBot. Please update the Webhook to the deploybot.com Webhook. Find your updated deploybot.com Webhook by going to Repository > Settings > Webhook & Badges in DeployBot. There are a few of things to check if your most recent Git commits are not appearing in DeployBot. From the DeployBot dashboard or the repository overview page select the “Deploy” option. 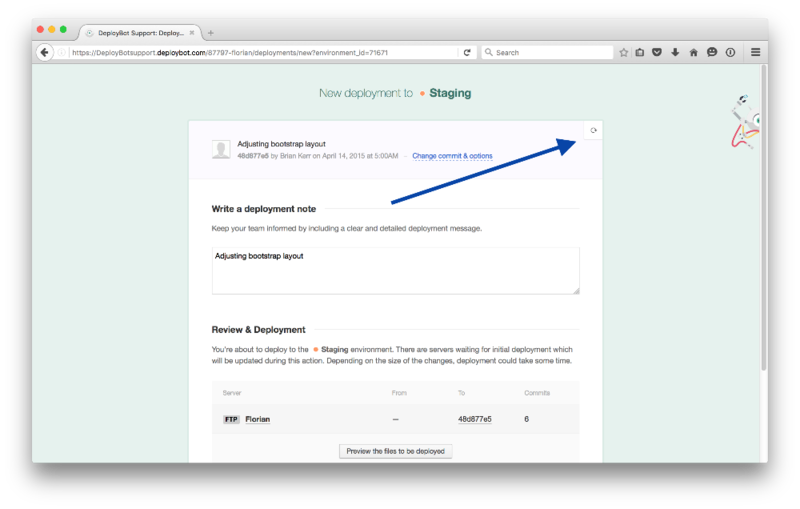 On the New Deployment page there is a refresh icon in the top right. This will pull in the most recent commit. Navigate to the repository where you’re wanting to refresh the commits. Once there, select "Settings” in the repository header. From the settings page go to the “Webhooks & Badges” page. The top section will include the webhook that makes automatic deployments possible. 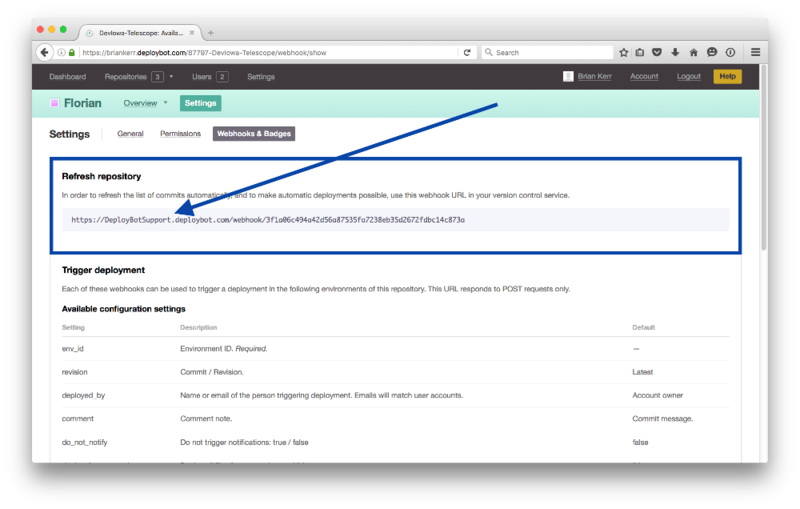 Copy the webhook URL and configure the webhook URL in your version control service. Please note: For the refresh repository webhook to work, the repository key should be authorized to clone from your repository. Navigate to the repository where you’re wanting to refresh the commits. Once there, select "Settings” in the repository header. From the settings page go to the “Webhooks & Badges” page. In the “General Details" section there is a "New commits not appearing?” header. From there, click on the “reconnecting your repository” link. 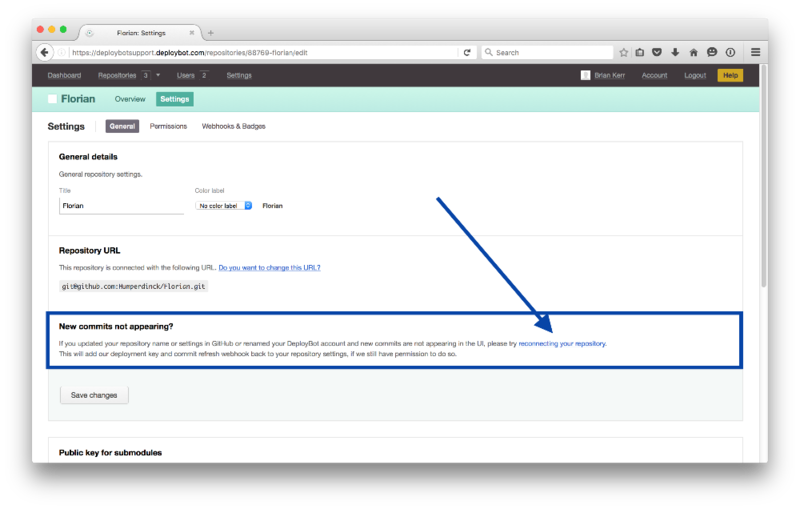 This will add our deployment key and refresh your repository settings. Please note: If your repository is self-hosted or he OAuth connection used to connect that repository has been removed the reconnecting feature will be unavailable. You will have to manually verify the webhook and key are setup correctly. If you're having issues getting your most recent commits to appear, please don't hesitate to contact our support. We are always glad to help.